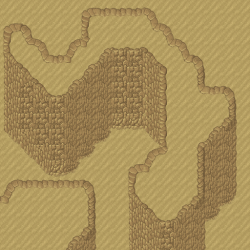 A 32*32 pixels desert cliffs tileset i made a while ago. 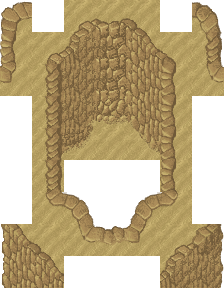 There's a lot of stuff to fix in it, but i doubt i'll ever work on that one again, so here it is. But i wonder why you care : it wouldn't be the first of my works (in progress) that gets used by the manaworld without care for license, credit, or even my opinion. Or do you think it is special because this one was posted in here? As if, because i didn't post everything i made in here, all the rest was automagically GPL-licensed? Well that, unless we're talking about derivative work from GPL stuff, is not true. So, it seems a bit weird to me that taking a piece of work from an author, using it and licensing it the way you like, would be a problem for the manaworld on this particular piece. arikel, this isn't the appropriate channel to vent frustration about a work that you think was inappropriately picked up by The Mana World as GPL-compatible content. Please contact somebody involved in TMW content development if there are any issues and I'm sure they can be quickly resolved. Well bjorn while adressed the question of why TMW developement team licensed something without having the rights to do so it failed to give me any reasonable answer. Here is where i asked http://forums.themanaworld.org/viewtopic.php?p=124367#p124367 the art is used and licensed without any rights, the "you post and we license thing" does not exist in any fantasious universe. This http://forums.themanaworld.org/viewtopic.php?f=8&t=10604 is arikel's property, TMW owns nothing. So that make me believe that Arikel asked them and they ignored him as they did to me. Arikel's complains are right, so please avoid to try to hide these things, Artists must know about these project where Art is autolicensed against the real author will just because they posted to ask for hints, so Artists can avoid these projects. I guess that maybe now i might have an answer but... it's too late, 6 days to take care of that kind of issues are way too much for my tastes. TMW tries hard to respect the rights and wishes of contributors, because we are contributors ourselves. Unfortunately, sometimes there is a misunderstanding. This situation was further complicated because developers come and go. Our current dev team wasn't around for whatever conflicts happened in the past. Once we learned of the concern about his Wyvern graphic, we immediately asked Arikel whether he wished it to be included in the game, and offered to remove it. He does great work, and we're grateful he replied and has now clearly offered this for us to use. If someone believes we use their work improperly, please contact us on our forums at http://forums.themanaworld.org/viewforum.php?f=13. Also, i apologize for being way too much agressive along the road but the topic was deeply sensitive and important to me. To finish i wish to donate the copyright of all the art (where i own that copyright) that i posted in TMW media to the project, as sign of faithful trust in this new Team. I also wish the best to this new TMW team.